The Dharti Bachao Cycle Yatra by Mr. Gyan Prakash Pandey, which had started from Gorakhpur, Uttar Pradesh on 5th June (World Environment Day), has now reached Faizabad (the old capital of Awadh). Prior to reaching Faizabad, and after leaving Basti District Headquarter, Mr. Gyan Prakash had reached and stopped over at Chhawani Bazar, Faizabad Road. He spent the night here with support from Mr. Maya Shanker Tripathi, Professer of a local degree college. 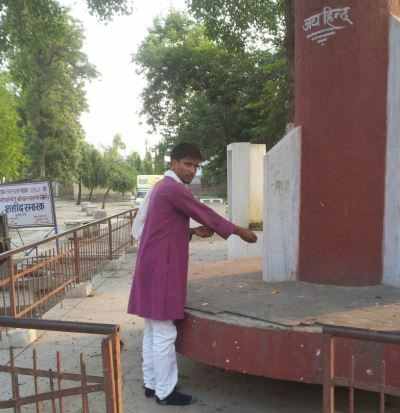 Chhawani Bazar is also the place which has a “Shaheed Smarak” which reminds us of the martyrs of 1857. 400 freedom fighters were hanged till death here by the Britishers in that year. After the night stay at Chhawani Bazar, Mr. Gyan Prakash reached Faizabad at 10.00 am on 7 June. Mrs. Bharti Singh, Convener of Mahila Sena, Faizabad received him at Faizabad along with Ms. Anita Srivastava. Mr. Gyan Prakash met the Sub-Divisional Magistrate at Faizabad in the absence of the District Magistrate and urged him for making environment protection a greater priority for the state. Mr. Gyan Prakash also addressed a press conference here. To further the cause of raising awareness for planting trees, improving sanitation and protecting the environment, Mr. Gyan Prakash met local social workers and people of various social organizations at Faizabad. Mr. Gyan Prakash left Faizabad for Barabanki at 3.00 pm and reached Lohia Pul on Faizabad-Lucknow Road, NH-28. He stopped here during the night of 7th June at a supportive Verma family house and resumed his Cycle Yatra for environmental protection on the morning of 8th June. The Dharti Bachao Cycle Yatra is a one man initiative to raise awareness for protecting Mother Earth and is now being joined by thousands of Indians. The Cycle Yatra also focuses on meeting district officials and making them aware about contemporary environmental issues while simultaneously urging them to carry out more and more tree plantations, ensure water and energy conservation, try to shift to renewable energy, ensure sanitation in the entire district, promote organic farming with farmers and strengthen PRAs for better implementation of schemes. Click here to follow the Dharti Bachao Cycle Yatra online!